There is a seemingly endless list of finished flooring materials (tile, hardwood, carpet, epoxy, polyurethane) that provide function, durability and aesthetics for their required purpose. 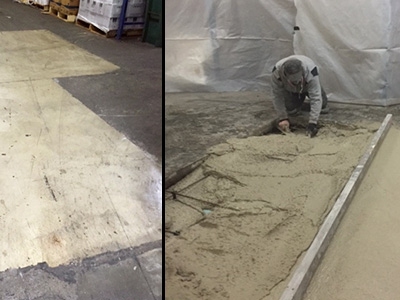 If the substrate is uneven or an elevation change is required, a self-leveling underlayment is used to accomplish that task. 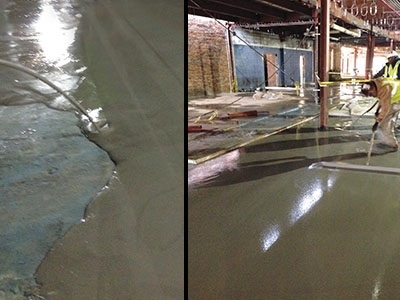 Rapid Set® LevelFlor® and Acrylic Primer or Concrete Leveler and Concrete Leveler Primer are used to level or raise the elevation of existing concrete substrates and provide a sound surface for finished flooring. The concrete subsurface was in dismal condition, with extensive craters and divots throughout. Contractors had to bring these numerous voids level to the adjacent concrete surface. Products used include Cement All, Concrete Mix, and LevelFlor. A refrigerator floor in Honor Foods’ busy Springfield, Mass. location needed repairs. The work needed to be done with minimal downtime to not disrupt services or damage perishable foods. Product used was Concrete Mix. 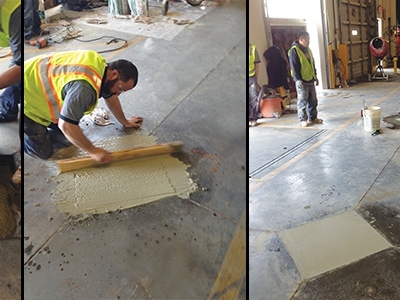 John Deere's McDonough distribution center’s concrete floor had become uneven over time, with large hollow areas (holes) forming where joints met. Since the business of getting needed parts to customers could not be disrupted, repairs had to be done quickly and during limited time frames each day. Product used was Concrete Mix.